Manufacturer CABLES TO GO INC. The Smart 3-Port USB Car Charger is an ideal solution for charging mobile devices while on long road trips or short commutes. 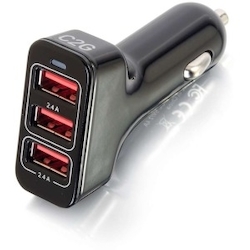 This high-performance car charger features a compact design for easy portability and provides a power output of 5V and 4.8A for device charging.